Can you believe it's the last weekend of September? The crisp autumn air, pumpkin flavored everything and cozy sweaters makes fall my favorite season in New York City, so every year I try to hold on to it as long as I can, but it is flying by fast! Chef Marc Forgione and LDV Hospitality open American Cut in TriBeCa today, Friday, September 27, in the hopes of redefining New York’s steakhouse experience. At the press dinner earlier this week, I was treated to course after course of phenomenal dishes. 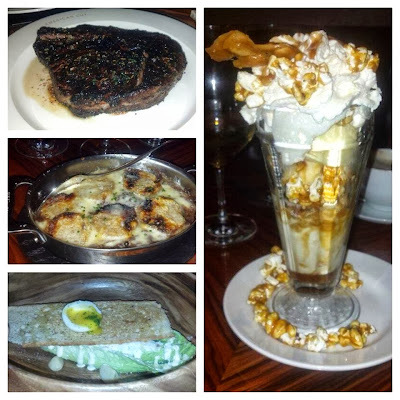 Make reservations asap to try the Chili Lobster, tableside Caesar Salad and the indulgent pastrami seasoned rib eye. And for more fall openings in NYC, visit here. Madison Square Eats is back for it's fall installment open daily from 11am-9pm, September 27th through October 25th. And for more fall food festivals, visit here. Find yourself a new fall bag at the Botkier Sample Sale, like a Valentina hipster for $70 (reg. $119) or a top-handle satchel for $115 (reg. $450). Because it's time to treat yourself to buttery leather cross-body bags and structured exclusives for the office, all up to 75 percent off! The sale ends this Saturday, September 28 and will run that day from 10 a.m.-7 p.m. Fill up on all the dumplings you can eat, from pierogis to potstickers, on Saturday, September 28 at Tang’s Natural New York City Dumpling Festival in the Lower East Side.